One of my favorite winter vegetables has to be the simple squash which has a buttery, sweet flesh that can be cooked and used in an endless variety of recipes. I often roast my squash and then use the tender sweet pulp to stuff pasta, as a side dish, or stirred into soups and stews although it is equally delicious used in baked goods and desserts. Winter squash is very healthy for you as it is a great source of beta-carotene, a good source of both fiber and vitamin C, and best of all is low in calories. 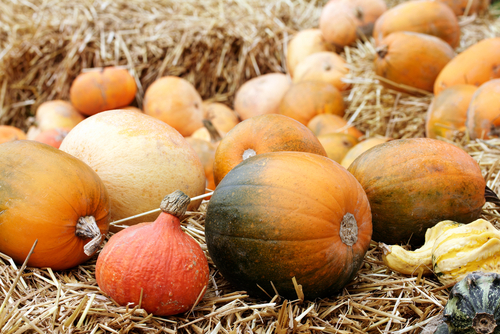 Some of the most commonly found varieties of winter squash include Pumpkin, Acorn, Butternut, Turban, Hubbard, Delicata, and of course the unique Spaghetti squash which can be used in place of pasta once cooked. What To Look For - Look for firm squash that feels heavy for its size. Rinds should have a dull sheen and be intact and hard. Slight variations in color are not important. If the stem is still attached, it should be rounded and dry, not shriveled, blackened or moist. Do not buy squash that is soft or has a cracked, watery, decayed or shiny rind. How to Store Winter Squash - Do not wash winter squash before storing, simply wipe away any dirt with a moist paper tow and dry. Most varieties of squash will keep up to 3 months if stored in a cool, dry place, although spaghetti squash has a shorter storage life of about 2 months and Hubbard squash may keep well up to 6 months. If buying squash already peeled and cut into pieces, store in plastic wrap or a plastic bag in the refrigerator and use within a week. How to Use Winter Squash - A small winter squash such as Acorn squash should yield about 2 servings. A pound of large squash yields about 4 half-cup servings of cooked pieces, or 1½ cups mashed. I prefer to bake or roast winter squash which brings out it’s natural sweetness, but it can also be steamed or cooked in the microwave. Baking Whole Squash - Wash squash and pierce several times with a sharp knife. Place the squash in a baking dish to contain it’s juices and bake uncovered. If using a conventional oven, the baking temperatures may vary, but 375 degrees F. works well. Baking time will vary according to the temperature of the oven and the size and freshness of the squash. A small squash may commonly be done in 45 minutes, while larger squash may take up to 1½ hours. If using a microwave, cook on full power 6 to7 minutes. Turn squash over and rotate. Cook for another 6 to7 minutes. To cook Spaghetti squash, bake whole as directed above, then remove seeds and scoop out the strands, loosening them to resemble spaghetti and top with your favorite tomato sauce. Baking Squash Halves or Pieces - Wash and cut squash lengthwise in half or into pieces. Remove seeds and strings, and lightly brush cut surfaces with oil or melted butter. You can also sprinkle the cleaned halves with brown sugar or Parmesan cheese, if desired. Place in baking dish with a few tablespoons of water and bake until fork tender, about 30 minutes at 350 degrees F. To microwave, cover and cook on full power 6 to 7 minutes, rotate, and continue to coo until tender.